At the beginning of this month, on the United Nations International Day of Older Persons, the Royal Hospital Chelsea hosted the launch of a vital new initiative ‘Stay Safe for Older People’ with the aim to help older people lead healthy and independent lives. The Stay Safe for Older People (www.staysafe.support) portal is a free information and resource website signposting older people and their family, friends and carers, to the wealth of available expert advice and support – ranging from safety in the home to avoidance of scams – under one easy to use umbrella site. It brings together materials and guidance from key organisations and experts to make it easier for older people and those who care for them to access vital knowledge when they need it. This helps them to ensure their safety and wellbeing and ultimately avoid hospital admissions arising from preventable accidents. 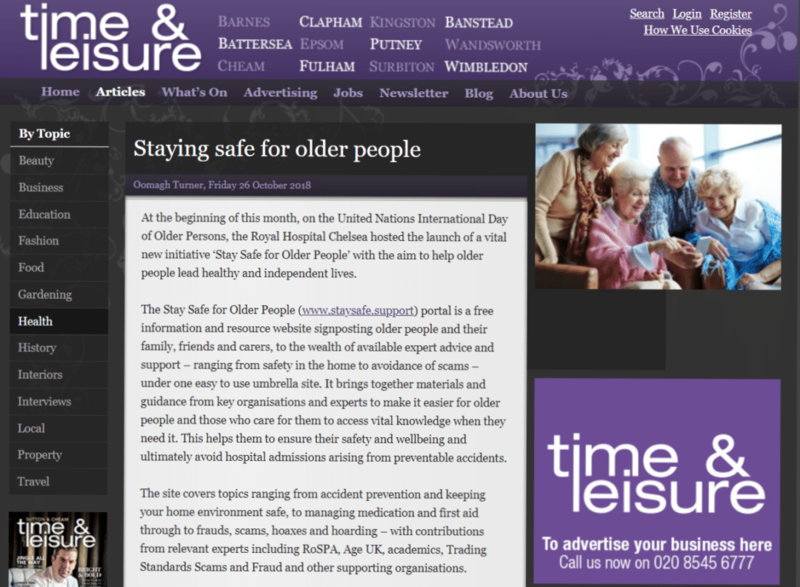 The site covers topics ranging from accident prevention and keeping your home environment safe, to managing medication and first aid through to frauds, scams, hoaxes and hoarding – with contributions from relevant experts including RoSPA, Age UK, academics, Trading Standards Scams and Fraud and other supporting organisations. The portal is supported by the Stay Safe Community Facebook group which allows users to access key experts directly to ask them for advice as well as offering a discussion forum for sharing experiences and useful information. Among the supporters of the initiative is Matthew Ryder, Deputy Mayor of London, Hugh Pym BBC Health Correspondent, and Dame Esther Rantzen.